THE LAST TIME I saw Michael J. Boskin on the tube, he was Chairman of the President’s Council of Economic Advisers under George Bush, and he was arguing against extending jobless insurance as the 1991 recession dragged on. Doing this would, he explained, discourage the unemployed from rushing to grab new jobs-jobs that were, he neglected to point out, a lot worse and paid a lot less than those they’d lost. I’ve already given you my notion that the CPI is not, and never was meant to be, a COLA. It measures changes in the price level, and that is not the same as changes in the cost of living (see “What Does It Cost You To Live?” NL, June 3-17, 1996). I don’t propose to go into that again in detail, but I do have a couple of points to add. I used to because the new ones cost too much. In fact, the last new car I bought was in 1982. Besides, they contend, items that used to be extras are now standard equipment, and so should be reflected in the CPI; what is more, the equipment is better than it used to be. Perhaps it is, but I used to be able (it was a fight, but I could win it) to buy a car without a radio and a tape deck and CD player and quadrilateral sound and white sidewall tires. Still, the Boskin commission thinks the CPI should be cut 0.6 percentage points for these reasons. Another claim they make, exactly contrary to the previous one, is that lots of things-literature, for example-are cheaper than they used to be. Eight or 10 years ago, a best-selling novel was $12.95 in hardcover; now it might be $25, but you can get a paperback for $10.95, and so are better off. (paperbacks once were 25 cents, but let that pass.) Indeed, they say, you don’t have to spend even $10.95, you can go to the library for free. I seem to remember that we could go to the library for free when we were children and the world was young; so the cost of reading shouldn’t be a factor in the CPI anyhow, even assuming that the CPI measures changes in the cost of living rather than changes in the price level. Speaking of-libraries, however, how do you factor in the fact that increased book and magazine prices, coupled with decreased budgets, have forced reductions in the number of books purchased and also in the hours libraries are open? Anyway, the commission wants to trim 0.4 percentage points for cheaper substitutes. Finally, they want to knock off 0.1 of a percentage point for the availability of less expensive places to shop, like warehouses. I don’t know of such a place in my neighborhood; and even if there were one, I can’t imagine how I’d get the stuff home or where I’d store it if I did get it home. I’d have to rent a larger place, which would surely cancel the savings from buying wholesale, not to mention the interest I’d have to pay on my investment in canned goods. The grand total of all the deductions comes to 1.1 percentage points. While this doesn’t sound like much, it amounts to between three-tenths and a half of recent COLAS. Everything I’ve said, of course, is anecdotal, but so are the explanations we’ve been given about the presumed inaccuracy of the CPI. There is another issue that is not anecdotal at all; it goes to the heart of the conservative passion for cutting the CPI. That is the effect of the CPI on the interest rate. It should be of particular concern to Chairman Alan Greenspan of the Federal Reserve Board. Although he was the first to make a public clamor about the CPI, he seems to be bashful or (maybe) blind to this issue. Almost always when he’s talking about the interest rate, Mr. Greenspan is careful to make clear whether he’s referring to the money rate or the real rate. When in 1993 he gave up on his attempt to use M2 to forecast the future, moreover, he indicated that the real rate continued to be the object of Reserve policy. The real rate, of course, is the money rate (the rate banks actually charge and we actually pay) less the CPI. Thus if the CPI is overstated by “at least” 1.1 per cent, the Federal Funds rate (the key rate the Reserve sets) is also overstated by at least 1.1 percentage points, as are all other rates. This should give Mr. Greenspan and the Republican-New Democratic cabal furiously to think. Right now the outstanding debt of nonfinancial sectors of the economy is about $14 trillion. That $14 trillion includes everything from what you owe on your bank credit card through Treasury 30-year bonds. If the CPI is 1.1 per cent too high, the annual interest paid on that $14 trillion is 1.1 percentage points too high-or $154 billion, almost 50 per cent more than the current budget deficit. Or look at it this way: During the past 10 years, while Alan Greenspan has been keeping the Federal Reserve’s eye trained on the “real” rate of interest, we-you, me, all the businesses of the land, and the city, state, and Federal governments-have paid over $1 trillion too much in interest. We will again pay $1 trillion too much in interest between 1997 and the mystic year of 2002. Now, the most that any of the Boskin commission expects to gain by cutting the Social Security COLA, modifying the brackets of the income tax, and holding down government and service pensions and disability entitlements seems to be about $200 billion over the next six years. If the commission would just take Mr. Greenspan aside and explain to him how the CPI is overestimated, he could save five times what the commission wants to dock the elderly and disabled. Not only that: Since he claims to have been aware for a long time of errors in the CPI, he could have made proportionate savings for us at any time in the last decade without bothering the elderly and disabled. The Federal Reserve Board is an independent agency with large staffs of well-paid economists, not only in Washington but also in the 12 district banks. It doesn’t have to base its policies on numbers crunched by the underfunded Bureau of Labor Statistics of the Department of Labor, which computes the CPI, or by the Boskin panel either. If the Fed were to take a responsible approach to the CPI question, it would sooner or later (depending on how fast they can do simple arithmetic in their heads) come up with a solution that would render irrelevant the Boskin commission’s report and all the debate and talk shows and editorials it has inspired. BEFORE GETTING DOWN to this solution, let’s make a minor adjustment in nomenclature. I used to talk about the “Bankers’ COLA,” but a friend has complained that the term made unfair fun of bankers; they, after all, are not the only ones to benefit from it. So suppose we now call it the “Fed’s COLA,” because it is the Federal Reserve Board that decides how big the interest rate’s cost-of-living adjustment is. The simple arithmetic is this: The Federal Reserve Board decides on an estimate of the current rate of change in the CPI, and then adds that estimate-the Fed’s COLA-to the “real” interest rate (which is determined altogether separately) to set the “money” rate. Multiply the outstanding indebtedness of the nonfinancial sectors of the economy by the Fed’s COLA, and you get its cost to the economy. Next, multiply the Gross Domestic Product by the same rate of change in the CPI (whatever it is). This will give you the cost of inflation to the economy, for that is what the Consumer Price Index is supposed to point to. Lastly, compare these two costs. In today’s economy it will turn out, no matter what the rate of change in the CPI is, no matter how or by whom calculated or by whom approved, that the Fed’s COLA costs the economy almost twice what inflation costs. The plain and simple reason, as Tom Swift used to say in a marvelous old series of books for 10-yearolds, is that the outstanding indebtedness of the nonfinancial sectors of the economy is, and has been for many years, almost twice the Gross Domestic Product. So when you multiply them both by the same number, no matter what it is, you get figures that are different by nearly a factor of two. It doesn’t take Tom Swift to see that if there were no change in the CPI, there would be no Fed’s COLA. Conventional economics, which is perhaps not so smart as Tom Swift, concludes that the thing to do is to get inflation down to zero, whereupon the interest rate could be lowered because the Fed’s COLA would be reduced to zero, too. In order to get inflation down to zero, though, the Federal Reserve Board (which is nothing if not conventional) raises interest rates to control inflation putting us right back where we started from. Since interest rates are set before things are made, and hence before prices are set, one might rationally expect that the proper procedure would be to get rid of the Fed’s COLA, which (if the estimate of the CPI change is correct) would get rid of inflation as a consequence. And if we got rid of inflation, we could get rid of all the other COLAS. And nobody would be hurt, as people are being hurt today. For a variety of reasons, this could not happen overnight. I’ll name two: First, monetary policy seems to take about two years to have a substantial effect. Second, most existing indebtedness has many years to run. But it shouldn’t take Tom Swift to convince us that we ought not to do the wrong thing just because doing the right thing takes time. What Does it Cost You to Live? THE ENTRY in this space for April 5, 1982, was titled “Let’s Put Indexing on the Index.“ The occasion was a Reagan Administration announcement of a shift in the Consumer Price Index (CPI). Fewer citizens than previously, it had been discovered, were buying houses. There was a reason for that. The going interest rate for mortgages had reached 15.84 per cent. You may be sure there were “points” and lawyers’ fees and title insurance and surveyors’ fees and such to pay, too. As a result, the real estate market was sluggish, despite the fact that the children of the Boomer Generation were coming on line. With fewer houses sold, fewer mortgages were undertaken. Although the interest rate was out of sight, consumers had less interest to pay because not as many of them could afford it. So the Bureau of Labor Statistics reduced mortgage interest as a factor in the CPI. This shrank the index as a whole and President Ronald Reagan got credit for controlling inflation, which President Jimmy Carter had not been able to do. 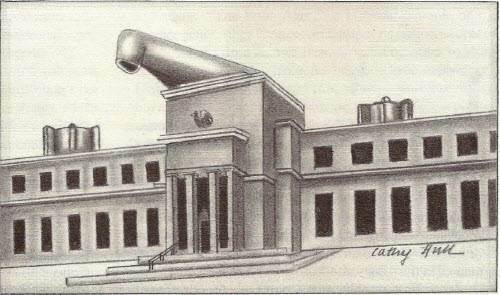 Now a similar scheme is being suggested. Federal Reserve Board Chairman Alan Greenspan, who seems to have been the scheme’s most prominent publicist, has a new and original end in view: He wants to turn the CPI into something it never was intended to be, in order to solve a problem no one thought existed. From its beginning in 1919 the CPI, issued monthly by the Bureau of Labor Statistics, has shown the changes in what urban consumers shell out for the goods and services they buy – commonly referred to as a “market basket.” (Farmers get much of what they consume “free.”) As with any index, the items in the basket are weighted to reflect how frequently they appear on the typical shopping list. It was the “weight” of mortgage interest, for instance, that was scaled down in 1982. Alone, an index number means nothing. 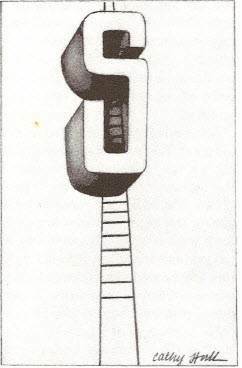 You must have at least two numbers that are put together in the same way for a comparison to be possible. The CPI is a series of numbers. Similar series are created by those trying to compare the price levels of different countries and periods. The CPI is used by historians as well as economists. And it is not discriminating. It does not try to measure the cost of what consumers ought to spend their money on; rather, it tells us what urban consumers do spend their money on. Over the long run, it needs periodic adjustments to accurately reflect the basket’s cost. In the short run, it is a measure of inflation and deflation. Fear of inflation has been the economic neurosis of our time. Especially after World War II, it became common for contracts to contain Cost of Living Adjustments, or COLAS. The purpose was to ensure that no party to a contract either profited or lost from shifts in the price level. In 1972 and ’73 the idea was adopted for Social Security benefits. In 1986 the tax brackets in the Federal Income Tax were “indexed” to the CPI, so that taxpayers would not find themselves creeping into higher brackets even though their “real” incomes had not changed. Now COLAS appear in many kinds of contracts, public and private. Bankers also have long charged borrowers an inflation premium that is a COLA in everything but name. What has been happening since Greenspan said last year that the CPI “overstates inflation” and should be corrected would be ludicrous if it were not liable to cause havoc in millions of lives. It seems that either the Reserve Board Chairman or someone with access to him happened to notice one day that the CPI doesn’t measure the cost of living. As we have seen, it never pretended to. Moreover, if Chairman Greenspan had time to stop and think, he would not only realize that the CPI is what is wanted in the sort of situation described above, but that the cost of living in a literal sense has nothing to do with it. In sad fact, it is probable the whole mess was caused by the childish attraction almost everyone in the government and the media seems to feel for acronyms. One imagines a publicity flack being given the job of announcing a contract that provided for “an adjustment of compensation to offset, nullify, and render nugatory substantial shifts, if any, in the price level.” After much fretting and black coffee, the flack, inspired, rushes in to the director of public relations, whose door is always open. “Look, chief,” she or he cries, “let’s drop all this garbage. Let’s call it a ‘cost of living adjustment.’ Then for short we can call it a ‘cola.’ Get it?” The chief says, “Not bad.” Then he or she shows how he or she got to be chief. “We’ll run it in caps,” he or she adds softly, taking out a pad and a Mont Blanc pen and printing the word in big capitals: “C 0 L A.” The rest is history. 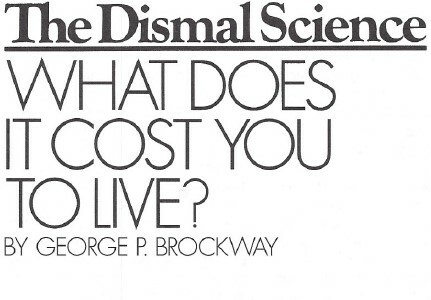 Possessed of the misapprehension that when people spoke of COLAS they truly meant what it cost to keep a person alive, Chairman Greenspan, though scarcely a close student of the physiological form of the problem, saw that many of the factors in the CPI were not essential costs of living. One hypothetical example seems to appeal to most of those who have taken up the idea. Think of beef, they say; everyone knows its price has gone up, but no one has to eat it, even in England. Chicken is not only cheaper, it’s better for you (less cholesterol, unless you persist in frying it); so chicken should be in the CPI basket instead of beef. That way, the cost of living would be less. Not even Speaker Gingrich is likely to argue openly that the cost of biological existence is all that should concern us. Nor does Chairman Greenspan, who has noted that the CPI may be overstated in part because it overlooks shoppers who switch to bargain brands and discount stores, really believe the index should tell us citizens what to eat and, afortiori, how to clothe and shelter ourselves. For my part, I do not think that there shall be no more cakes and ale, and I doubt that either the Chairman or the Speaker thinks so. The cost of living, as Lear implies, may well require a standard, but index numbers are compared with each other, not an exogenous standard. THAT BRINGS us back to the purpose of COLAS. They are not, and never have been, intended to lift Social Security benefits up to the poverty level. They couldn’t do that at any acceptable cost if we wanted them to. In the case of union contracts, they would not be worth bothering about if poverty were the best they could guarantee. No, the COLAS were and are meant to offset the effects of inflation. Needless to say, the CPI is not a perfect yardstick. In particular, there are serious difficulties with the way the housing component is calculated that result, as Dimitri Papadimitriou and L. Randall Wray of the Jerome Levy Economics Institute have shown, in an accelerating upward bias of the index. On the other hand, when senior citizens cozy up to the fireplace on cool evenings, they are apt to exchange anecdotes about how everything costs a great deal more than it used to. Having said all that, let me say further that I am opposed to indexing in principle, for it is always and everywhere inflationary. In every case where, as in the Weimar Republic, a runaway inflation has occurred, indexing has been at the bottom of it. But, as I’ve written before, “Bankers Have the Classic COLA” (NL, January 9, 1989), and as long as they have it, the rest of us are entitled to all the CPI-driven benefits we can get. With the support of economic theorists, bankers (and lenders generally) divide the interest they charge into two parts: “real interest,” which is what they would charge in a stable economy, and their COLA, or “inflation premium,” which is generally said to be the same as the year-to-year change of the CPI. At first glance this seems as reasonable as any other COLA, but it doesn’t work out that way, because the total indebtedness of the nonfinancial sectors of the economy (you, me, the corner store, and the government) is almost double the GDP. In other words the total Bankers’ COLA, while supposedly designed to protect lenders from inflation, is about double what inflation costs the whole economy (lenders and borrowers and everyone). The arithmetic is apparently too simple for most economists to understand: In 1995, the rate of change of the CPI was 2.5 per cent; the total indebtedness was $13,804.2 billion; so the Bankers’ COLA was .025 x$13,804.2 billion, or $345.1 billion. At the same time, the GDP was $7,297.2 billion, which, when multiplied by .025, gives $182.4 billion as due to inflation. Take away the Bankers’ COLA of $345.1 billion, and the economy is in deflation, not inflation. I am, you may be sure, aware that the 1995 CPI applies only to indebtedness incurred in 1995, which is only about a twelfth of the total. The other eleven twelfths include mortgages and Treasury bonds stretching back to 1965, though almost all debts are of more recent vintage (the average length of current public debt is less than six years). The key point is that in only one of those 30 years (1986) was the change in the CPI lower than in 1995. In short, taking 2.5 percent as the Bankers’ COLA rate for all debts outstanding in 1995 gives lenders a generous benefit of a serious doubt, particularly since it is not unknown for individual bankers to figure more than the CPI as the inflation premium. In sum, if there were no Bankers’ COLA, there would now be no inflation, hence no occasion for all the other COLAS, hence no need for Chairman Greenspan to raise the interest rate to “fight inflation,” nor for Speaker Gingrich to weary himself dreaming up arcane tricks to play on the elderly. I want to point out that if the Board Greenspan chairs devoted itself to getting rid of the Bankers’ COLA, it could lower the interest rate and put us on a fast track to a balanced budget and a more humane and more prosperous America. HARDLY A DAY goes by without your being asked by a political party or a news organization or some other public-spirited body to name the three or five or 10 most urgent problems facing America today. If you subsequently reflect on your answers, you are likely to realize, whether sadly or cynically, that little or nothing will be done about any of the problems, even those that have a large majority worried about them. The reason is simple: We don’t have the money. Everyone knows we can’t have universal health care; we can’t have a welfare system we’re not ashamed of; we can’t have a superaccelerator; we can’t improve our schools and colleges; we can’t keep our libraries and museums open as long as they were 60 years ago; we can’t clean up the pollution of our air and water; we can’t fix our roads and highways; we can’t clear our streets of garbage; we can’t hire enough cops and judges or build enough jails to curb crime – because we don’t have the money. Everyone knows this, and everyone, from the President to this year’s kindergarten graduate, says it every day. But everyone is wrong. What we don’t have is intelligence. What we don’t have is good will or strong will or, honestly, any will at all. What we don’t have is the ability to learn from our experience. We don’t even have common sense and ordinary decency. Pogo was right: We have met the enemy and they is us. 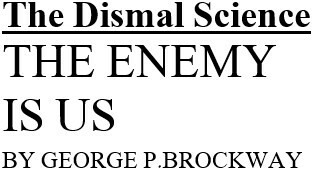 “Enemy” suggests a couple of lessons from World War II. When Germany started the War, the papers were full of prophecies that despite its possible superiority in tanks and airplanes and training, it would surely lose. You could try all day and never guess why; so I’ll tell you. Germany would lose because its gold reserves were too low, even though Hjalmar Horace Greeley Schacht had been trying to conserve them by bartering instead of paying cash for the things it needed. It didn’t have the money. All we had to do was to sit back and wait for it to collapse. Five and a half desperate and bloody years later, collapse did come, but not because the Germans lacked gold. They lacked manpower. At the end, they tried to defend their “heartland” with half-trained regiments of teenagers and retirees. They were overwhelmed. During the War we had a money problem too. After all, when Germany attacked Poland we were slowly pushing our way out of the Great Depression. Then as now, the Federal budget deficit was on everyone’s lips. We were on the road to serfdom (at the time inflation was more a promise than a threat). By 1945 the national public debt reached $235.2 billion, or 111 per cent of Gross National Product. That sounds like bankruptcy if you have heard Warren B. Rudman and Paul E. Tsongas making a fuss over the present ratio of 66.8 per cent. Given our clearly not having the money to pay for the War, we should have surrendered and undertaken the close study of German and Japanese management practices from the ground up. Yet somehow, before the year was out, we won the War. More than that, as we demobilized our Army and Navy, we enacted the GI Bill of Rights, enabling the wartime generation to be the first in history to have a college education and to buy their own homes. Two years later we still didn’t have the money, but we started the Marshall Plan and saved Europe. Afterward we enjoyed a quarter century of more rapidly rising wages than we’ve had since, higher corporate profits after taxes than we’ve had since, lower inflation than we’ve had since, and lower unemployment than we’ve had since – all at once. We could have done more (President Truman tried to get universal health care almost a half century ago, but was blocked by the American Medical Association and the Republican Party); nevertheless, what we did do was better than we have managed lately. Let’s look at a somewhat less impersonal situation. Think about the Baby Boomers. Their parents and grandparents won the War and passed the GI Bill and saved Europe with the Marshall Plan. Of course, this increased the national debt left to their children. Now I ask you: Would the Boomers have been better off if they had not been saddled with a victorious America, prosperous parents, and a recovered Europe? Next, let’s think about the Boomers’ children – the present younger generation that we are worried about saddling with debts we don’t have the money to pay. Are we doing them (or the nation) a favor by cutting the deficit so that those who happen to survive the measles (we don’t have the money to vaccinate them all) will grow up half educated and in dangerous, squalid surroundings? Or will we do anyone a favor by leaving children essentially uncared for while we force their mothers to work at jobs that won’t pay enough to lift them out of poverty? Finally, think of your own children. Where are you going to find $125,000 apiece to send them through college? Should you go into debt, along with them, or should you give the whole thing up? And what about your mortgage? If you have one, it is because you want a better place to live and to raise your children than you could otherwise afford. If you die before the mortgage is paid off, your estate will have to pay the balance and your children’s inheritance will be diminished. Is that mortgage against your children’s interests? Like all good rhetorical questions, these have obvious answers. The resulting problems have equally obvious solutions, if we stop long enough to consider the distinguishing marks of the capitalist system we praise so mindlessly. MODERN CAPITALISM depends on ongoing indebtedness to support ongoing investment in ongoing production that will provide ongoing income. This is something quite new under the sun. For convenience we will call what we previously had mercantilism. To be sure, the two systems have run together, and certainly are not disentangled yet, but let’s try to focus on their differences. To begin with, rather than burdening themselves with ongoing indebtedness, good mercantilists followed Polonius‘ advice: “Neither a borrower nor a lender be.” If they did borrow, they did so for a specific purpose and paid off the loan as quickly as possible. In contrast, AT&T, industrial giant though it is, rolls over its massive debt as that comes due. Alexander Hamilton foresaw that a national debt, widely held by prominent citizens, would be a stabilizing and unifying element in the new republic, and so it has been. Second, instead of investing in ongoing enterprises, mercantilists looked for big deals where they could make a killing. The merchants of Venice took shares in a particular voyage of a particular galley. As recently as a hundred years ago, most American corporations were chartered in New Jersey or Delaware because other states would grant charters only for limited and specific purposes. In contrast, a modern corporation is usually at least moderately diversified and is, theoretically anyway, immortal. Third, because of its ad hoc investing, the characteristic mercantilist form of profit is the capital gain, which is realized when the investment is withdrawn and the enterprise ceases. In contrast, the characteristic capitalist investment continues indefinitely, produces a regular flow of goods, yields regular dividends, offers regular employment, and pays regular taxes. When money was gold or silver or some commodity, or was convertible to some commodity, the amount of borrowing that could be done in an economy was limited by the amount of the money-commodity. Today, when money is realized credit or debt, the amount of borrowing is limited by the amount of unused resources, especially labor, available to the economy. In the United States at present we have upwards of 17 million potential workers who are either unemployed, underemployed, discouraged, or turned off. That’s about an eighth of our work force and represents an enormous available resource, greater than the labor power of most nations of the world. We also have all the urgent, if not desperate, needs we mentioned in the beginning. Our problem is to use this resource to meet those needs. Modern capitalism has tried to do that and has failed. It has been an enormous economic success in many ways, but the market, as economists rather coolly admit, has imperfections. The state, therefore, has to create the jobs – and that will take money. Let’s say it will take $20,000 for each of the 17 million people in our “resource,” or $340 billion. Well, $340 billion sounds like a lot of money, but it is really only 5 per cent of the current Gross Domestic Product (GDP). It is little more than half of what I call the Banker’s COLA (the extra interest the Federal Reserve Board encourages lenders to charge to “protect” themselves from inflation, which is itself a principal cause of inflation). Most of the money would be borrowed, just as businesses borrow the money they require. During World War II the Treasury and the Federal Reserve cooperated to keep the prime rate at 1.5 per cent. If the government borrowed the entire fund at 1.5 per cent, the interest would be $5.1 billion per annum – less than one tenth of 1 per cent of the GDP. The additional taxes paid by newly employed workers would far more than cover that. There remains the nagging mantra: We don’t have the money. Do we not? What do you think has pumped up Wall Street so that bored TV anchors tell us “trading was moderate” on days when half again as many shares change hands as in the frenzy of the Crash of 1987? Why must brokers and bankers weary themselves thinking up $14 trillion worth of “derivatives” (three times as much as our total national debt) for people who don’t know what to do with their money, while others search out ways to speculate on growth industries in Tashkent, now that they have ruined Mexico? No, we have the money, all right. What we lack are brains and guts. On July 20, Federal Reserve Board Chairman Alan Greenspan announced a fundamental change in the way the august body he heads looks upon the economy. This is not merely a tactical shift, as from easy money to tight money – although the Board’s volatility on the tactical level is bad enough – but a basic rethinking of how the economy works and what the Board should therefore do. It is the second such revision in Greenspan’s six and a half years as chairman, and the fourth in something under 14 years. So many radical rethinkings in so few years suggest an unseemly flightiness in an institution whose primary excuse for existence is to provide financial stability beyond the turmoil of partisan politics. Let’s look at the record. On October 6, 1979, Paul A. Volcker, the then new chairman, revealed that thereafter the Reserve would “be placing greater emphasis on day-to-day operations of the supply of bank reserves, and less emphasis on confining short-term fluctuation in the Federal rate” (the rate at which banks borrow reserves from each other overnight or for a day or two). Monetarism had taken charge. For the next six or seven years we heard a great deal about M1 and its velocity. (In case you’ve forgotten, M1 is cash and traveler’s checks and checking deposits; M2 is all that plus most savings accounts, money market funds, and other odds and ends.) Milton Friedman, the leading monetarist, wanted M1 to grow annually between 3 and 5 per cent. Expansion beyond 5 per cent, he claimed, would cause inflation – instantaneously if the expansion was anticipated, or with a lag of a year if it was not. Not only that, but the inflation would accelerate without limit. By 1986, expansion beyond 5 per cent was surely anticipated by all rational economic agents, because it had not been below 5 per cent for 10 years. Yet in 1986, when M1 jumped 16.8 per cent (and M2 jumped 9.4 per cent), the Consumer Price Index (CPI) rose only 1.9 per cent – its smallest rise in 22 years. Monetarism clearly missed the call, and missed badly. The Federal Reserve Board was left without a theory – that is, without a coherent idea of what it was doing or why. For the rest of Volcker’s term, the nation was forced to rely on seat-of-the-pants judgments of officials whose cerebral judgments had proved sensationally wrongheaded. 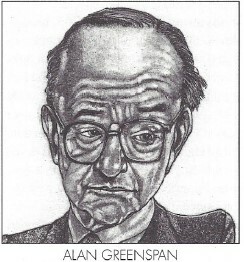 In the spring of 1987, Alan Greenspan succeeded to the chairmanship and at once set three economists to work on an equation intended to use M2 to prophesy the price level two or more years ahead. Also, true to the teachings of Ayn Rand, he cut expansion of M1 and M2 back below the 5 per cent target. And what did the CPI do? It surged ahead 4.4 per cent in both 1987 and 1988. Of course, the money supply never was a reliable indicator, for the simple reason that no one can say what it is. The Federal Reserve owlishly publishes aggregates it calls M1, M2, M3, and L. L is about six times M1. Friedman once said the number used did not matter, so long as one stayed with it. Since the tracks of the different aggregates have been substantially different, it would appear to have made some difference. You would think that by this time we might all agree to stop fretting over the money supply. Yet the Reserve, perhaps for ritualistic reasons, has adopted a new target for M2 growth (1-5 percent), even though it acknowledges that hitting (or missing) the target won’t indicate anything special. The downgrading of M2 does not mean the Chairman is without any indicator. He has mentioned only one aspect of his new one (and that I will discuss presently), but he has used it with results that can hardly be called encouraging. In his July 20 testimony before Congress, he forecast a second quarter growth rate of 2.5-3.0 per cent. Nine days later, the official number proved to be 1.6 per cent. I think I can promise you that the new indicator will continue to get things wrong. According to Greenspan, “one important guidepost” of the new indicator win be the so-called “real” interest rate: the actual rate minus the rate of inflation. When, as now, the Federal funds rate is about 3 per cent and the CPI rate is about 3.5 per cent, the “real” Federal funds rate is negative 0.5 per cent. Anyone lending $1,000 at 3 per cent gets back $1,030 at the end of a year, but his purchasing power will have shrunk to $993.95. So why should he lend? Because if he buries his money like the slothful servant in the Parable of the Talents, he will still have his $1,000 but his purchasing power will shrink to $965. Greenspan thinks that’s unfair and hints about raising the Federal rate one-half a percentage point or more to make things even. Naturally, if he raises the Federal rate, he effectively raises others, including those that are far from negative. What Greenspan is threatening is a Cost of Living Adjustment (cola) for bankers. It is well understood by bankers and economists that colas on workers’ wages are inflationary and should be resisted. How are bankers’ cola different? 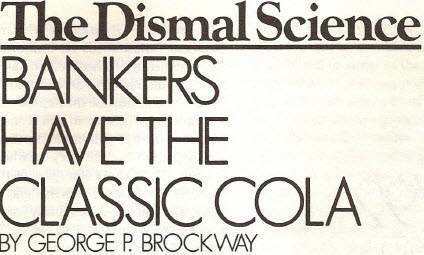 In a word, they aren’t, and they cost the economy (that is, you and me) about $500 billion a year (see “Bankers Have the Classic COLA,” NL, January 9, 1989). Although bankers do most of the talking about the interest rate, their role in lending is comparatively passive. If no one wants to produce a better mousetrap or buy a better automobile or take a flyer in the stock market, bankers must sit on their cash. Putting consumers and speculators aside for the moment, consider a company with plans for a better mousetrap, requiring investment in a factory, equipping it with machinery, buying supplies, hiring workers. The company figures all that to cost $10 million. For convenience, let’s say it can borrow at prime, currently 6 per cent, for an annual interest expense of $600,000. It feels it can just about swing it. Now suppose Greenspan gives bankers a one-half percentage point cola. At 6.5 per cent, the interest expense is up to $650,000 – an increase of 8.3 per cent in cost, and a decrease of 8.3 per cent in the amount of money the mousetrap company can afford to borrow. The company then has three options: (1) Abandon or scale down the expansion and the jobs it would have created. (2) Raise prices to cover the added cost. (3) Make do with lower profits, which would make future borrowing still more expensive. These options are faced every day by every company, large or small. Even rich companies that do not need to borrow must consider the opportunity cost of using their own money instead of lending it out. If investment is as important as everyone says it is, and if stable prices are as important as the Reserve says they are, Greenspan’s half point adjustment would be bad for every company and for the whole economy in one of the ways I’ve noted, and quite possibly in all three ways. Not only that, but the bond market would fall, as it necessarily does when interest rates rise. The stock market would surely follow later, for the same reason – and, considering its present fragile highs, could very well crash. The interest rate, not the money supply, is what the Federal Reserve Board can control directly and assuredly. It sets the Federal funds rate and the discount rate, and it controls them by buying or selling Treasury bonds on the open market. In order to buy, it offers a high price, which is the same as a low interest rate. The banks that sell bonds thus increase their cash reserves, putting additional downward pressure on the interest rate. If all this activity increases borrowing, as it is likely to do, it will increase the money supply, because money is negotiable debt. But who cares? It is the interest rate that matters to the economy, and it is through stabilizing the rate at a low level (about half what it is today) that the Reserve could (if it would) do its bit to stabilize the economy. Milton Friedman has long contended that the Federal Reserve Board has used its great powers so erratically in the past that it should be put under strict statutory regulation. He may be right. But he would regulate the growth of the money supply within a narrow range, even though he doesn’t know what the money supply is, and the Board has shown it doesn’t know how to control it, whatever it is. That there is a determinate money supply, and that its size determines the price level, is an old mercantilist idea. It was valid enough when money was something rare and tangible and not readily reproducible, like gold or silver. The capitalist system turns on borrowing, however, and borrowing depends on the interest rate, and the lower the rate the greater the economy. How long must we allow ourselves to be deluded by archaic ideas? 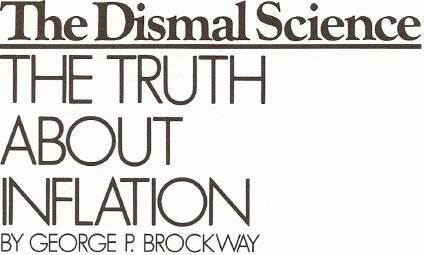 IN THREE recent contributions to this space I have argued that the conventional theories of inflation are wrong-that it is not caused by full or almost-full employment, and that it is not cured by raising the interest rate. I have gone further: I have maintained that raising the interest rate (which I call the Bankers’ COLA) is precisely what produces inflation in the first place. A legitimate question now is: What do I propose we do? Let it be admitted – nay, insisted – at the outset that there aren’t any easy answers. No matter how ingenious the laws we enact, we can be certain that ingenious ways of avoiding them will be discovered. Legal avoidance happens with even the most uncomplicated statutes. There is a book out on how to defend against a drunk-driving charge by a trial lawyer who has had thousands of such cases and never lost a one. The unremitting search for loopholes in the income tax laws is sporadically countered by searches for ways to close them. It will be the same with whatever we propose. Perfection is impossible, because perfection cannot act. The foregoing, however, earth shaking as it is, would not be enough. For the archetypical speculators of our day are not beefy gents in flashy suits on the order of Betcha-million Gates or even aristocratic gentlemen with narrow ties on the order of J.P. Morgan or even indescribables like Ivan Boesky. No, the big-time wheeler-dealers are “institutions,” and institutions are churches and colleges and foundations and pension funds and insurance companies and mutual funds. We might almost say with Pogo that we’ve met the enemy and they is us, for most of us are beneficial owners of pieces of one or more of the nameless, faceless institutions the market gossips gossip about. These institutions, our surrogates, write the computer programs that run the market, and they do it for capital gains. Unless that candy is taken away from them, it will do little good to take it away from the old-time speculators who still exist. Consequently, we’ll have to take a deep breath and tax the capital gains even of charitable institutions. (I said it wasn’t going to be easy.) The demand of nonproducing speculators for money would thus be greatly reduced, if not altogether stopped, and the Reserve Board, by increasing the money supply, could lower the interest rate for everyone else and take a step toward eliminating the Bankers’ COLA. Our capital gains tax would cancel the commodities option and could be made to cancel the real estate option, but suppose the Senator’s million-dollar lender is smart and doesn’t lend at all, thus saving that $50,000 “loss.” He would be like the unfaithful servant in the parable, for at the end of a year he would have only his million dollars, while his neighbor, who wasn’t so smart and lent his million at 10 per cent interest, would have $1,100,000. What happened to the $50,000 loss Senator Proxmire talked about? If there was anything more to it than fancy rhetoric, the 15 per cent inflation affected both investors. The one who refused to lend wound up with $850,000 worth of purchasing power, while his neighbor wound up with $950,000. A negative “real” interest rate, in apparent defiance of the laws of mathematics, proves to be greater than zero. Perhaps we can count on the lender not being a complete idiot. Of course, the millionaires have other choices. They could take their money and invest it directly in productive enterprise, or they could live it up. The former option is what we had hoped they would do, anyhow; that’s why all the editorial writers in the land have been urging them to save. As for the latter option, they might find consuming a million a little difficult, but it would be fun to try, and the economic result would at least be some priming of the pump. Someone has to consume what the economy produces. The fact remains, though, that both millionaires have taken a loss in purchasing power, and that deliberate, cold-blooded national policy has forced the loss upon them. That’s not nice, and it’s nothing we can be proud of. So what can we do? Well, all that the Fed and other true believers in traditional economics have proposed (and put into practice) is raising the interest rate, usually by restricting the money supply. That’s how former Reserve Board Chairman Paul A. Volcker got the prime interest rate up to 21.5 per cent in December 1980, while the Consumer Price Index was up only 13.5 per cent, leaving Senator Proxmire’s investor with “real” interest of 8 per cent, which should have made him happy. The funny thing was, it didn’t make others eager to become like him. The real interest rate was greater than the prime itself had ever been (with one exception) before 1978; nevertheless, the national savings rate fell, and in spite of the subsequent Reaganomic tax cuts for the wealthy, the savings rate continued to fall. Moderately reflective true believers should have had their beliefs shaken just a bit. Moderately compassionate believers should have been severely shaken by what else happened. The number of people unemployed went from 6.1 million in 1979 to 10.7 million in 1983. In the same years, 9.2 million more people were impoverished, and the median family income (in constant dollars) fell $2,305. That was not so nice either, and it was brought about by deliberate, coldblooded national policy. Nor was that the whole story. The Federal deficit soared, our foreign trade was savaged, and Latin America was saddled with loans at un-payable interest rates. And all this was done to keep the real interest rate from falling below zero. 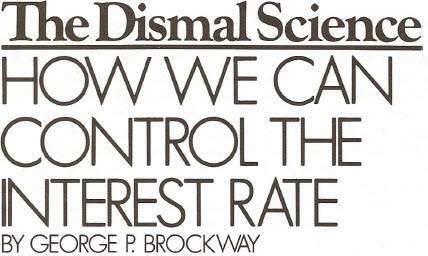 IFTHAT WERE merely a trade-off – suffering a lot of grief and getting back a little stability – it would be bad enough, for what was exchanged was the livelihood and prospects of millions of fellow citizens for the” reality” of usurious interest rates. The economy was deliberately depressed to “save” it from the possibility – the mere possibility – of being depressed later. But the savings rate continued to fall, corporate investment continued to fall, and industry after industry was allowed to fall before the Germans and Japanese, the Koreans and the Taiwanese. At this point Wall Street-wise types will explain that Volcker was concerned about more than Senator Proxmire’s millionaire; he was concerned about the Japanese. He needed their money to pay for the deficit, which was all of $40.2 billion in 1979 (or about a third of the Gramm-Rudman target President Bush is going to be unable to meet). If Volcker had not given the Japanese what they wanted, they wouldn’t have bought our bonds, and Proxmire’ s millionaire would have sent his money abroad. The argument, in short, is that any attempt to reduce the interest rate will cause a flight from the dollar, and that the flight cannot be stopped because the financial world is international, its denizens are multinational, and they communicate electronically, instantaneously and secretly. That is almost true. Yet multinational corporations are taxed. Granted, some of them may not be above diddling their books a bit, and very likely the diddling is difficult to detect; but taxes are collected, and where taxes are collected money can be controlled. 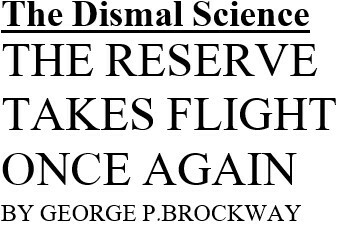 The fact that financial operatives set up shop in the Cayman Islands to escape inconvenient regulation indicates that a flight from the dollar has to be an actual flight; a pretended flight won’t do. We could perhaps stop the flight if we wanted to, but it would be much easier to let the money go. It is merely marks on paper; the factories and even the computers remain. The time to do the stopping is when the money wants to come back. Under present law, the Treasury Department is responsible for control of foreign exchange. It could require those who want to bring money into the country to go to the Treasury to buy dollars and to satisfy any taxes and regulations they had been fleeing from. The flight would no longer be so attractive, or serve any purpose. Would that be the end of the problem? Of course not. Still, the proper direction of policy is, I think, clear. To control inflation, the interest rate has got to be brought down – way down. To do this, money has to be withdrawn from speculation and made available to productive enterprise. Faced with inconvenient regulation, finance will flee the dollar. The flight can be controlled by controlling foreign exchange. Such control will certainly affect foreign trade; but only doctrinaire true believers in laissez faire will blanch at that, and doctrinaire laissez faire is what got us into the mess we’re in.